As a blogger using WordPress, I recently switched to Google Custom Search Engine instead of the default search box, just to give better user experience when searching the whole blog. Google Custom Search Engine not only index the posts of a blog, but also the comments left by readers who often bring nice content for a blog. However, there is a slight disadvantage of Google Custom Search Engine compared with the search box of WordPress. Google Custom Search shows advertisment based on the queries searched. Of course, it is comprehensible that Google relies on ads revenue whenever offers “FREE” services to users. 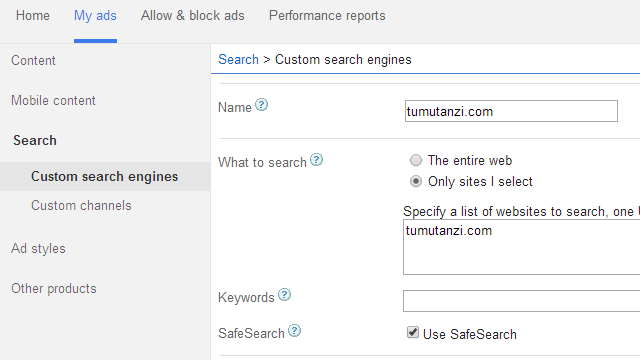 Custom Search Settings Hang on “Saving” When Adding Adsense Account Info – Won’t connect to AdSense. Turning on the butter “on” of “Search Engine Monetization” does not work, it stucks at “saving” status but “Google help page” still tells you can do it. I presumably joked that maybe Google discourages users to turn on the Monetization feature since it shares ads revenue with users. The question is how to fix the problem. I found a solution. Simply go ahead to your AdSense account page, make a new custom search engine under “My ads” (“Custom search engines” of “Search”). OK, go back to Google Custom Search control panel, you will find a new search engine with the edition “Free – (partner CSE)” is out there. The “Search Engine Monetization” feature of the new one is already on and associated with your AdSense publisher ID. You can also set up the new search engine as you want before you put the search code to your website. Have fun and make money from Search Engine Monetization of Google. Google AdSense is not so popular in China. This post is not so interesting for readers who do not use Google AdSense and Custom Search Engine. As you know, most of readers of my blog are Chinese (or at least originally), but I think the post is pretty useful to guys who face the bug on the whole internet, that is why I wrote this post in English. Very good！I can say only these two words. I am now in Belgium. It is a pity AdSense removed the function for Chinese AdSense.